We are working on a new Distro Install Process as we speak. The plan is to let you go through the normal Centos Setup screens with a full Centos ISO and than we will prompt you with a payload/version option for what version of the Distro you want to install and it would pull down the packages it needs for the Distro like Asterisk, Dahdi, FreePBX and such so the amount of time it spends pulling down packages from the Internet should be about 1/4 of what it currently is with the Net Install only option that we have. Which brings be to this Blog. We are trying to come up with a better version number for the Distro mainly because lots of people equate the 1.8.2.x-x with that we are either using Asterisk 1.8.2 or FreePBX 1.8. What I am thinking of is as followed. 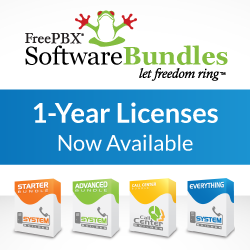 Which would equate to Asterisk 8.5 with FreePBX 2.9 and Centos 6.0. I would love feedback from everyone on what they would like to see in regards to version numbering so we can polish off the new Full ISO builds for everyone this week. This will also allow you to wget the setup script from our webserver and just execute the script on any stock Centos Machine to turn it into a full fledge FreePBX Distro system.